Nintendo has annouced that there will be a Super Smash Bros. Ultimate planned for Wednesday. 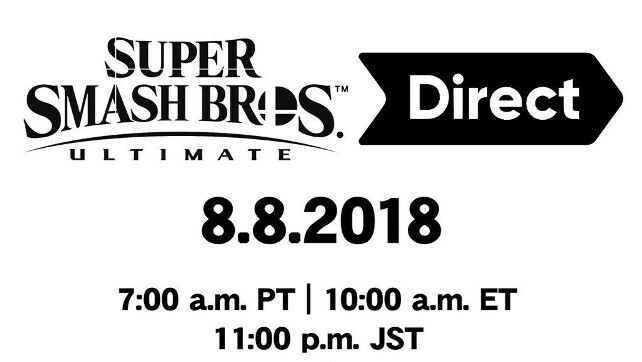 The Direct will be a worldwide presentation and the brief notice states that the direct will start on August 8th, 2018 at 10:00am ET. The direct will feature new game information delivered by game director Masahiro Sakurai. Will there be an announcment of any new fighters for the game? While the game features the return of every fighter from previous games, and there have already been a few new fighters already announced, the addition of even more fighters would be welcome. The presentation will likely touch base with how the game will integrate with Nintendo Switch Online, which launches next month.